I write a blog, SilverLining, about a pond near my home. In the spring, I try to get out with my camera every day and take photographs of what’s happening there. 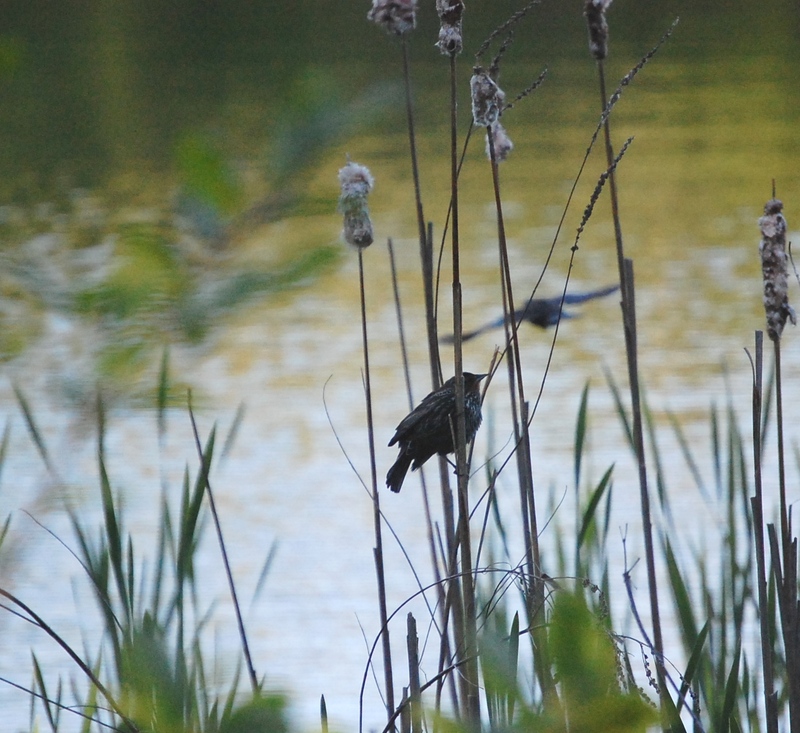 In the last two years I have come to love watching the Red-winged Blackbird and listening to its varied calls. To capture this week’s action, I created the slide-show above (a first for me) using Windows Media and then I put it up on YouTube. I decided to post it here at sublime days, as well as at SilverLining. For the past two days, three male red-winged blackbirds have been actively showing off their prowess, by chasing each other – two at a time, through the air over the pond – to win the attention of the females who rarely shows their shades-of-brown selves as they sit quietly, hidden in the reeds. Here’s a female. Note her nonchalant attitude toward the male, who you can see in the background just barely staying above the water as he shows off his well honed flying skills. I don’t believe the male birds are being hostile to each other. In fact, they seem to enjoy what they are doing and it seems, too, that they are actually assisting each other in demonstrating their skills. I have wondered if the display is to convince the female of their ability to fend off any prey that might try to get at the young in the nest. The males chase each other, and roll and tumble in the same airspace, sometimes becoming entangled before they regain their “air” and fly off together. There is one image in the show that I’ve titled “the clash.” It is that image that shows the entangled birds. The birds rest between encounters, but not for very long – perhaps a few minutes at most. This activity seems to be in full swing in the early morning hours and then for an hour or two before sunset. I’m neither a studied naturalist nor a trained photographer. I just love observing and recording what I see at the pond. For these pictures, I used my 200 lens on the Nikon D40. At that magnification the frame is small. So, I actually was moving the camera and using manual focus to capture this action. Auto-focus could not have kept up with the speed. And for every shot I have that is in focus, there were probably ten that were not! So, as an amateur photographer, I am stunned to have more than one image to show of the aerial display. These birds are zooming through the air. And their flight is erratic. Sometimes they stall mid-air, then roll or tumble or abruptly reverse direction. You might get a sense of this in some of the contortions you see in the images. The Beatles instrumental, “Flying,” accompanies the images. I hope you’ve enjoyed the show! I’ll think about your thoughts about the music. Try it again, listening a little longer. A beautiful melody is woven through the song. Thanks for your visit to my site! Absolutely loved the pictures of flight – we still have a lot to learn – they are so much more pliable and maneuverable than our metal monsters. Sometimes the background colors turned your picture into paintings; work of art. As for the music, the metalic beat in the backgroung caused me to shut it off about 3 seconds into the show. To me the music sounded martial not free flowing – the beating of feet rather than the soaring of wings. Maybe something classical and very much in the background – or none at all. The beauty and skill of the birds is the thing – from a little egg to a master of flying – amazing – thanks for astonishing and inspiring moments. Mary my friend you are amazing. I love the pictures…what a great job you have done. Mom would have been so impressed with your pictures. I am going on a bird walk next week with some friends…you have inspired me…I’ll have to see what pics I can get. You mother’s photos are an inspiration to me. She had the gift of “being one” with nature – and her eye and lens showed us all its glory. Thanks for sharing Mary. They’re my favorite birds, I just love hearing those calls in the spring. To me they signal that winter is over and spring has sprung.